Kildare’s Win Rate in over 500 League and Championship games since 1956 is 53%. Not the most shocking statistic you’ll ever read if you’re a seasoned Lilywhite watcher. Win one, lose one sounds about normal. Win rate in the O’Byrne Cup: 70% – 64 wins in 91 games over the same period. 11 wins since 1962 putting us on top of the Leaderboard (Meath and Dublin have 9 each). That statistic might help to explain the small frisson of anticipation when January comes around. We’re quite good at this competition. But it’s not really about winning the thing out. You never heard the Curragh of Kildare echoing around St. Conleth’s Park or Parnell Park among the coughing and spluttering on the last Sunday in January. Another stat: 70 players over the last 40 years have played O’Byrne Cup football for the Lilies without ever being handed a jersey for a League game, let alone for Championship. The competition wasn’t always treated seriously by the County Board. In 1980 a challenge match with Roscommon clashed with a trip to Wexford and the O’Byrne Cup tie was given also-ran status, without wishing to be unkind to the largely under-21 team that represented us. Many of that team played their one and only senior game that day*. But nuggets have been unearthed in the winter soil. One of my earliest memories of the competition was when we won it in 1982 after a 6 year gap. We were sporadic winners of what was a sporadic and unloved competition back then. On a miserable day in Newbridge, Wicklow were comfortably beaten with “new full forward Seamus Fahy” scoring a goal on his debut. It all went south for him eventually of course. 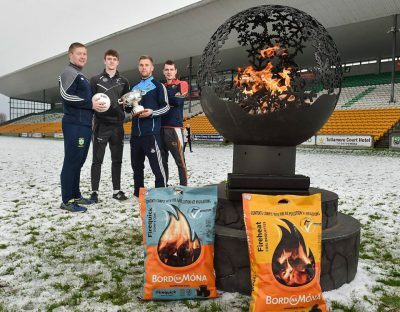 Last year, another Sarsfields man, Ben McCormack, was the one who stood out, scoring eight points in three outings while the less heralded David Slattery also gave some notice of his potential with 1-1 against Carlow IT. Thankfully the colleges have departed the scene and although we now only have two group games, they should at least be reasonably competitive against Louth and Longford. Cian O’Neill has 10 new players in the panel and the side selected for tomorrow night’s joust with Louth in the venue formerly known as Hawkfield is a lovely blend of the tried and tested and those hoping to make a name from themselves. Ollie Crinnigan made goalkeeping synonymous with the Carbury club and Aaron O’Neill looks like another great talent between the sticks. Fresh from minor and without a senior club championship appearance to his name, he takes advantage of Shane McNamara stepping away to provide Mark Donnellan with competition between the sticks. Watch for his kick outs. If Moorefield brought one thing to the table in their county and Leinster runs this year it was a defensive resilience that Kildare could only dream of. With the exception of Mark Dempsey and perhaps James Murray, it’s hard to see Moorefield contributing too many to the Kildare back line this year. And yet they certainly were bigger and better than the sum of their parts. What Cian O’Neill would give for some of that cussedness. With his own Moores background and with Roli beside him you’d think he could bottle some of it. He needs to. The frailties that let Donie Kingston waltz through in Tullamore weren’t addressed head on last summer with Dublin and later Armagh fully exploiting that looseness. It’s good to see four newcomers in the back six then, although the speedy Eoin Powderly has been involved before and is now recovered from a cruciate injury. Many of our problems last summer seemed to originate in the right-corner and it will be interesting whether Round Towers’ Mikey Kelly, one of the most lauded club defenders of recent times, can stake a claim for a role here. He comes with a reputation for “stickiness” and that’s not a trait overly common in the Kildare backline. Daniel Courtney brings power to the wing back position, while Kevin Flynn on the other wing is a lighter alternative, with energy and pace and an ability to steal forward for important scores. Plenty to see in the backline then. Kevin Feely’s emergence as one of the country’s finest midfielders, evidenced by a deserved All Star nomination, has compensated somewhat for the absence of a perfect centrefield foil for the Athy man. Tommy Moolick is perhaps unfortunate to suffer from a similar lack of pace to Feely and as such he has taken something of a back seat of late as we try to find a more balanced combination. That’s not to write off the Leixlip man whose workrate and penchant for getting into scoring positions remain a valuable asset. Paul Cribbin has dallied with the midfield position but unconvincingly and inconsistently while Fionn Dowling seems destined to put the ‘super’ into supersub (it’s 26 competitive sub appearances now compared to 21 starts). So Luke Flynn’s availability after a fleeting appearance against the same opposition two years ago is to be welcomed. With similar qualities of pace and power to his brother Daniel, the younger Johnstownbridge man brings the potential to offer something very different to the Kildare midfield as well as providing back-up to various defensive roles. We watch with anticipation. Up front Mark Sherry is back at wing forward after taking a couple of years out but many eyes will be on Brian McLoughlin, the Clane youngster, who has looked a star in the making through his underage years. No doubt six or seven subs will be used at a minimum. The Leinster council in their wisdom are allowing unlimited subs from the match-day panel of 26 and that resulted in 20 subs being used in the Wicklow and Carlow match at the week-end. Pens and pencils at the ready! * We’d still love to identify the “R.Hurley” who played wing back on that occasion and is the only player from 40 years of team line-ups we haven’t been able to identify. Sounds suspiciously like a Johnstownbridge man to us.